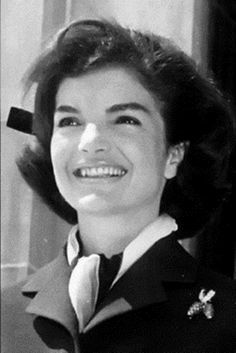 Jacqueline “Jackie” Bouvier Kennedy (born: July 28, 1929 died: May 19, 1994) was the wife of the 35th President of the United States, John F. Kennedy. 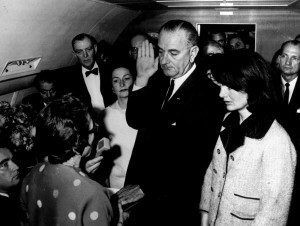 She was the First Lady from 1961 until her husband’s tragic assassination in 1963. 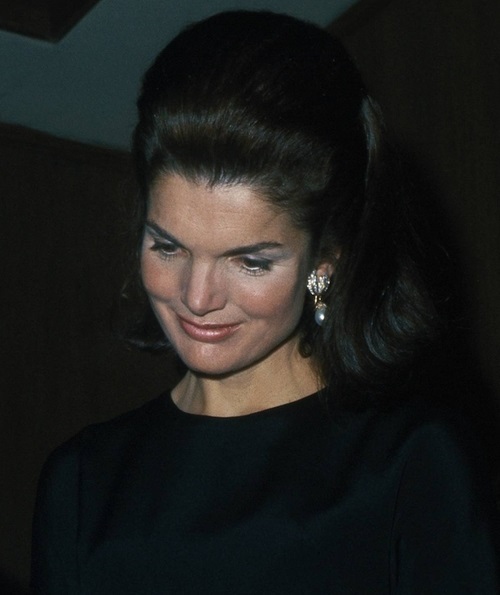 She was young and beautiful, only 31 years old at the start of her husband’s presidency, and during her years in the White House she set the fashion style for the nation in the early 1960s. 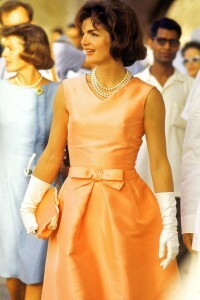 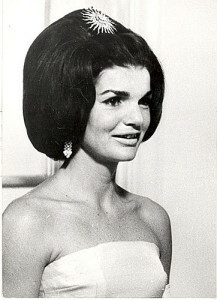 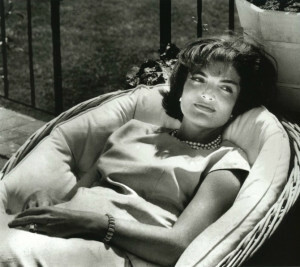 The American public was fascinated by her simple but elegant clothing, her iconic pillbox hats and bouffant hairstyle. 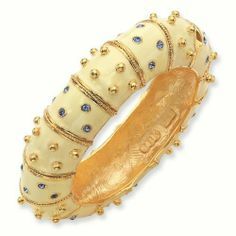 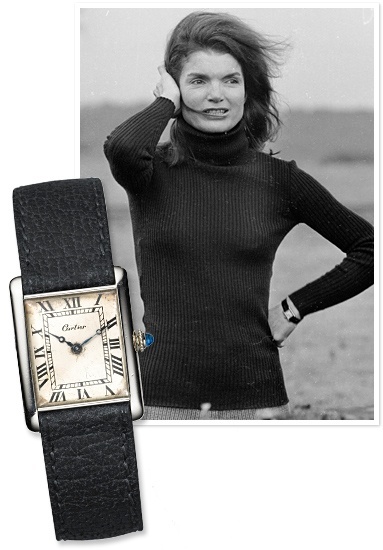 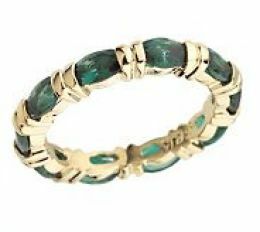 Her chosen designer, Oleg Cassini, was selected shortly before the inauguration just as he was just emerging in the fashion industry. The First Lady and Cassini worked together throughout her husband’s presidency, collaborating on her wardrobe for official engagements which would reflect Jackie’s personal sense of style, with a distinctive and subtle European fashion design while being manufactured in the United States. 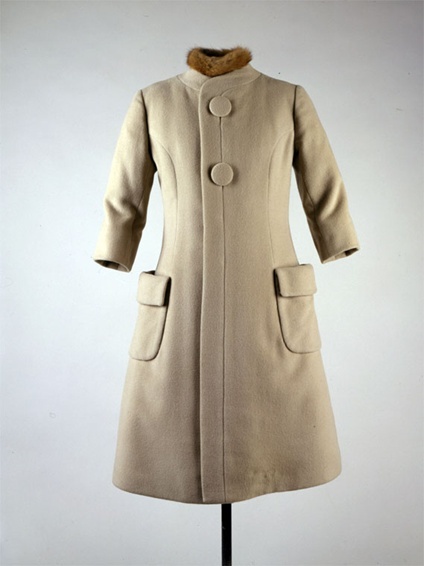 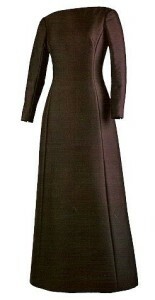 The dresses had simple, clean lines featuring A-line skirts, three-quarter length sleeves or most often sleeveless sheaths matching coats or two piece suits consisting of a simple straight skirt and matching jacket for daytime events. Also for daytime wear shoes, gloves and hats were custom made or purchased to match each individual outfit. Although Halston did not originally come up with the pillbox hat design, he did make several custom hats for the First Lady. 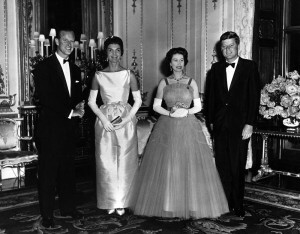 For nighttime engagements, such as State dinners or other more formal occasions, the dresses were either knee-length or floor-length, depending on the event, and similar in their design elements but made from elegant fabrics sometimes with chiffon, beading or silk embroidery accents. 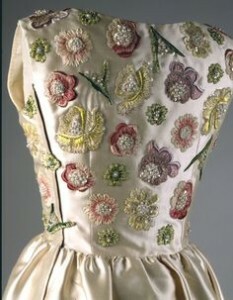 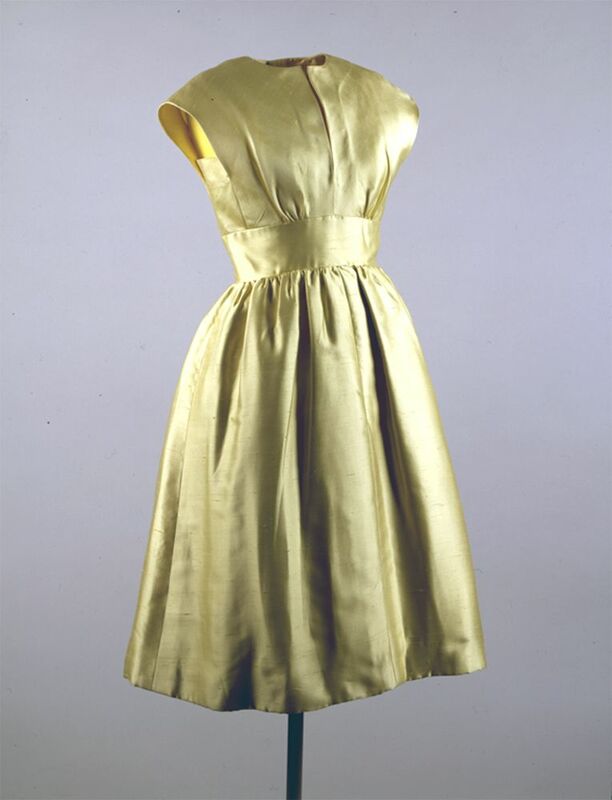 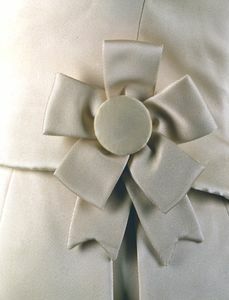 Cassini produced over 300 dresses for Mrs. Kennedy during her time in the White House and all the dresses were made by a staff of skilled seamstresses specifically assigned for making the clothing for the First Lady using fabrics of the finest linen, wool, satin and shantung silk. Cassini was not the only fashion designer of Mrs. Kennedy’s dresses during the White House years and occasionally she collaborated with other designers. 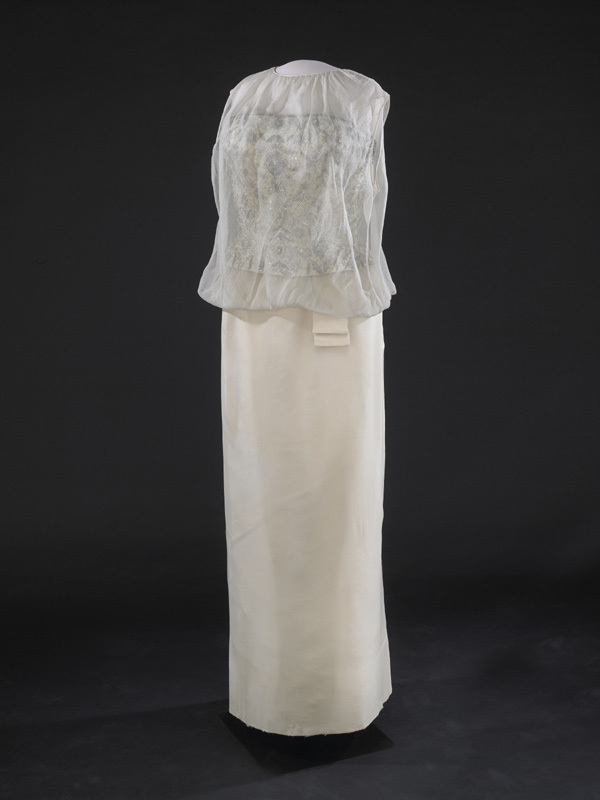 In 2002, while on a visit to Washington, D.C., I saw the “Jacqueline Kennedy – the White House Years” exhibit which featured several of her dresses worn during that time. 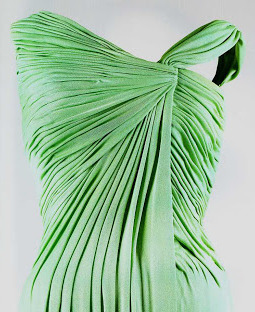 It was a great experience to see these dresses that inspired and set the style for a generation and upon see the displays, the dresses were beautifully made with wonderful detailing. 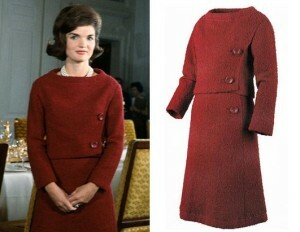 So, let’s start by looking at a few of Mrs. Kennedy’s iconic dresses which she worn as the nation’s First Lady. The dresses are listed in chronological order dating from the beginning of her husband’s presidency with the Pre-Inauguration Gala through to the end with the assassination and funeral of President Kennedy. 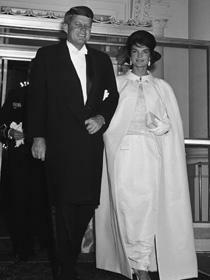 On the evening of Inauguration Day; after the swearing-in ceremony, congressional luncheon and parade, President Kennedy and Mrs. Kennedy formally dressed for the several Inauguration Balls planned for the night festivities. 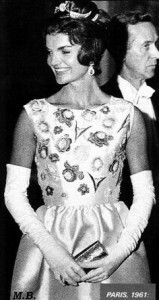 Mrs. Kennedy wore an off-white sleeveless gown made of silk chiffon over peau d’ange (satin-weave fabric) featuring a strapless bodice embellished with silver colored silk embroidery thread and seed pearl beading, a matching cape with toggle closure at the neck was worn over the dress. 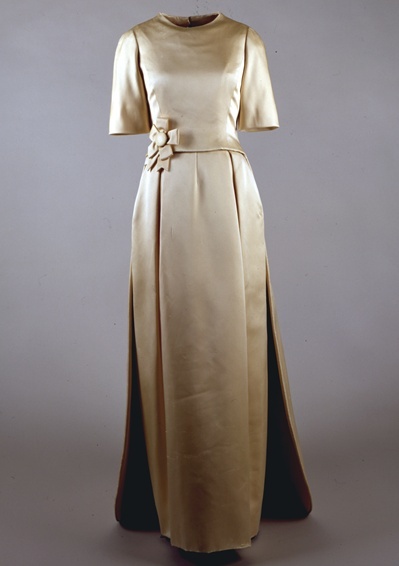 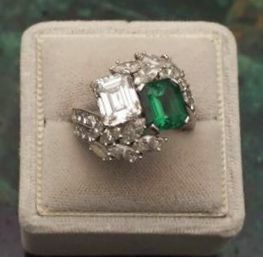 The dress was designed in collaboration with Mrs. Kennedy, who drew the sketches of her dress ideas, and Ethel Frankau of Bergdorf Custom Salon located in New York City. 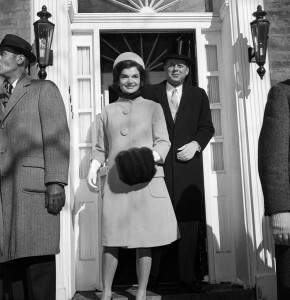 During the Kennedy administration, Mrs. Kennedy was responsible for an extensive White House restoration. 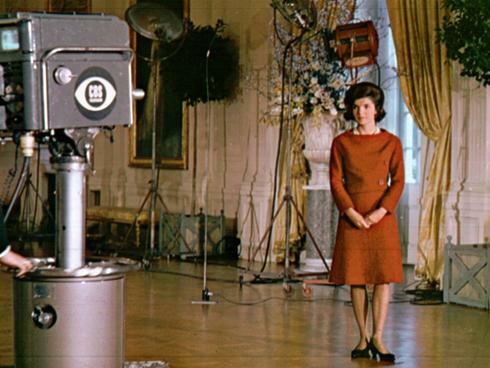 When the project neared completion, a special CBS pre-recorded televised tour of the White House was given by Mrs. Kennedy on February 14, 1962 and was watched by millions of Americans; incidentally she won an Emmy for the broadcast. 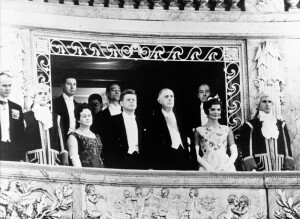 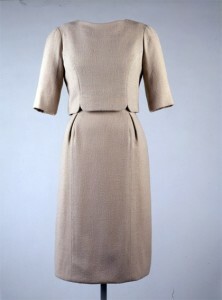 For the televised program, Mrs. Kennedy wore a two-piece day dress by Chez Ninon featuring long sleeves and a bateau neckline (a high wide neckline that follows the curve of the collarbone ending at the shoulder seams), the dress is said to be a copy of a Christian Dior original. 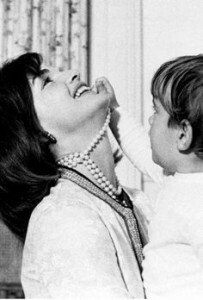 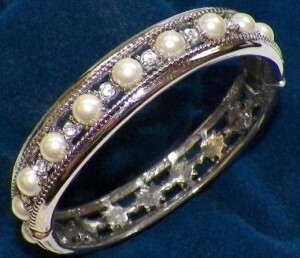 To complete her ensemble, Mrs. Kennedy wore a three strand pearl necklace and pearl earrings. Before traveling to India for a diplomatic trip, Mrs. Kennedy stopped in Rome and had an audience with Pope John XXIII at the Vatican on March 11, 1962. 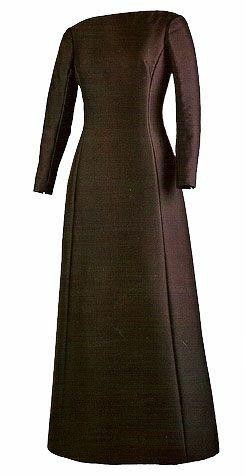 Per the strict rules of the Vatican regarding papal visits, Cassini designed a full-length long sleeve black dress made of black alaskine (a sturdy fabric that is a blend of wool and silk) worn with a stiff taffeta petticoat underneath. 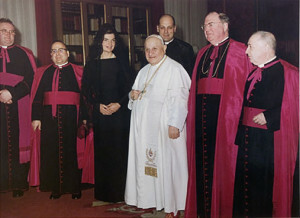 To complete her ensemble, the First Lady wore a long black mantilla (a lace or silk veil or shawl worn over the head and shoulders). Mrs. Kennedy traveled to India and Pakistan with her sister, Lee Radziwill, on a diplomatic tour on March 12-26, 1962. 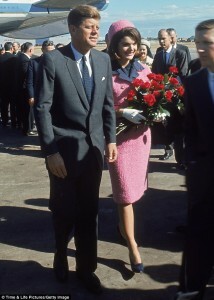 Taking inspiration from the countries she was to visit, her wardrobe for the trip was designed in more colorful colors. A perfect example of this was the bright dress she wore on March 17, 1962 which she wore for a boat ride on Lake Pichola in Udaipur, India. She wore a Cassini designed sleeveless apricot colored, knee length dress made in ziberline (with a v-neckline which was accented with a bow at the waist. 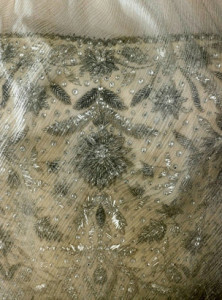 During the diplomatic trip to India and Pakistan, Mrs. Kennedy wore a dress designed by Gustave Tassell. The dress was made of pale yellow silk shantung and featured a slit opening at the neckline, cap sleeves and a three-inch wide band around a fitted waist with a full skirt. 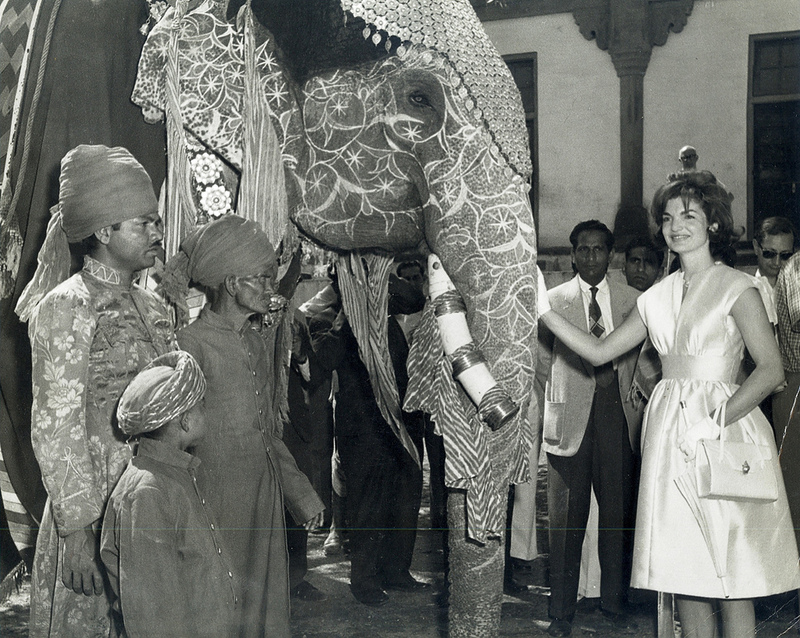 While in Jaipur, India, where the First Lady met with members of the Peace Corps, she was joined by her sister for an elephant ride at the Amber Palace. 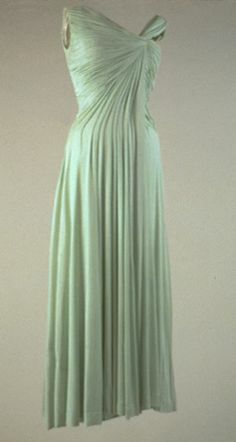 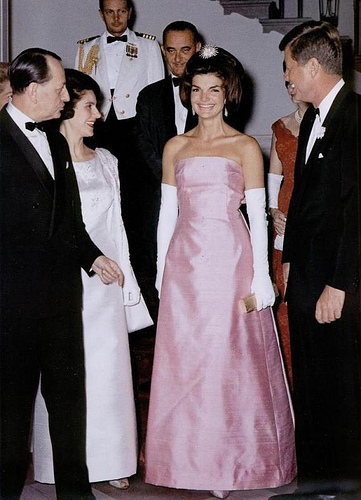 Mrs. Kennedy wore a lovely evening dress designed by Cassini in a beautiful shade called celadon (a light green color) made in a silk jersey. 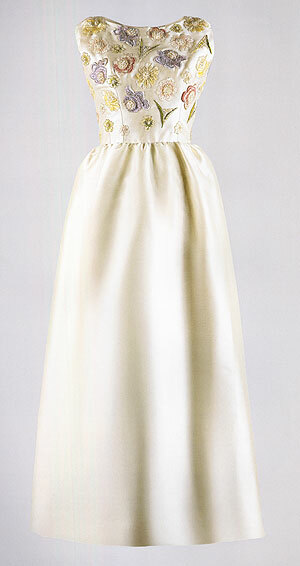 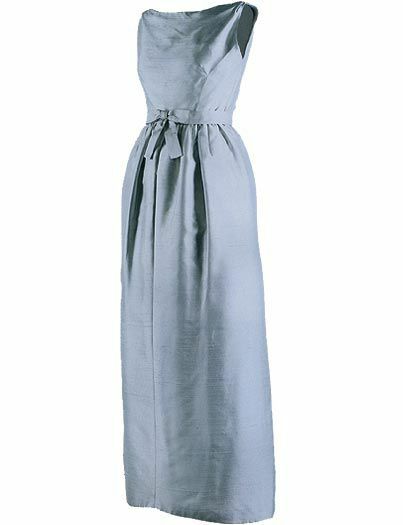 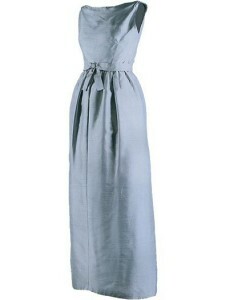 The dress is very fluid in style and features a gently draped bodice and skirt forming soft pleats. 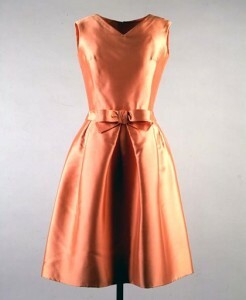 Mrs. Kennedy wore the dress to a dinner honoring the Nobel Prize winners which was held at the White House in Washington, D.C. on April 29, 1962. State Dinners at the White House were always formal events and the one honoring Andre Malraux, the French Minister of Culture. 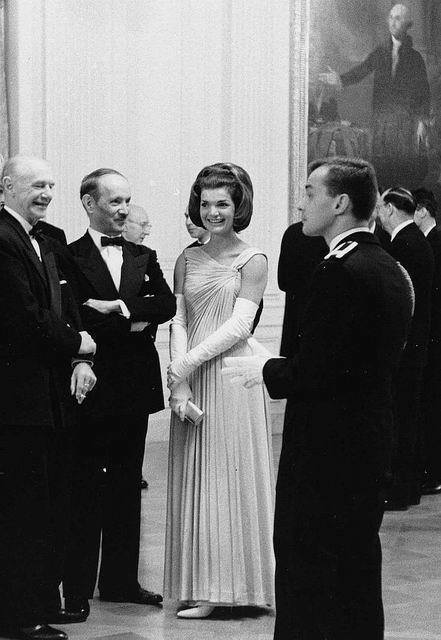 Malraux was responsible for bringing the Mona Lisa portrait by Leonardo da Vinci to the United States and a dinner was held at the White House on May 11, 1962 to honor him. 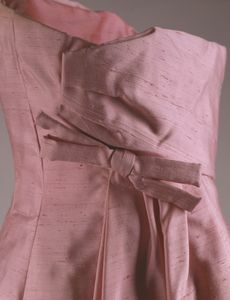 Mrs. Kennedy wore an evening gown designed by Guy Douvier made in a soft pink silk shantung, the dress wraps together in the back and is tied with a stiff Kabuki-style bow. 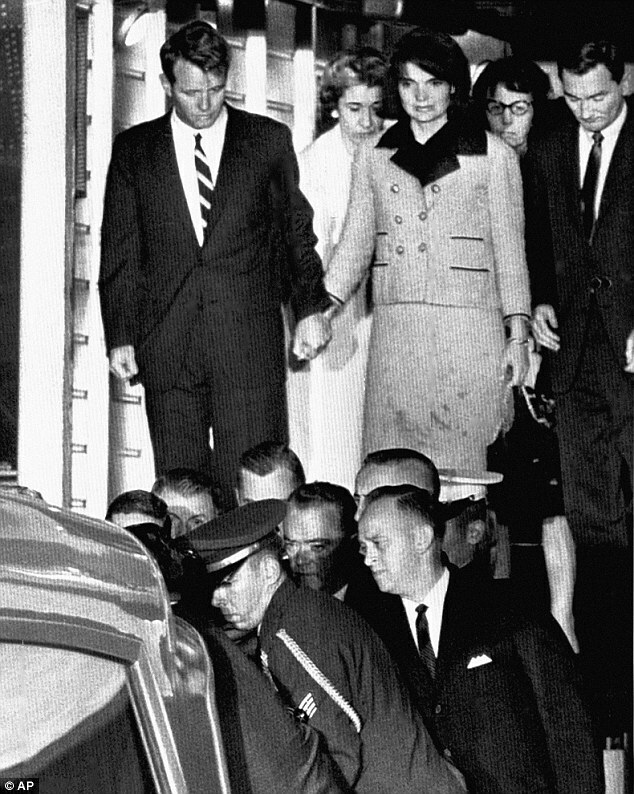 Tragically, while the motorcade was traveling through the streets of downtown Dallas on November 22, 1963 President Kennedy was shot and fatally wounded, and later died at Parkland Hospital. 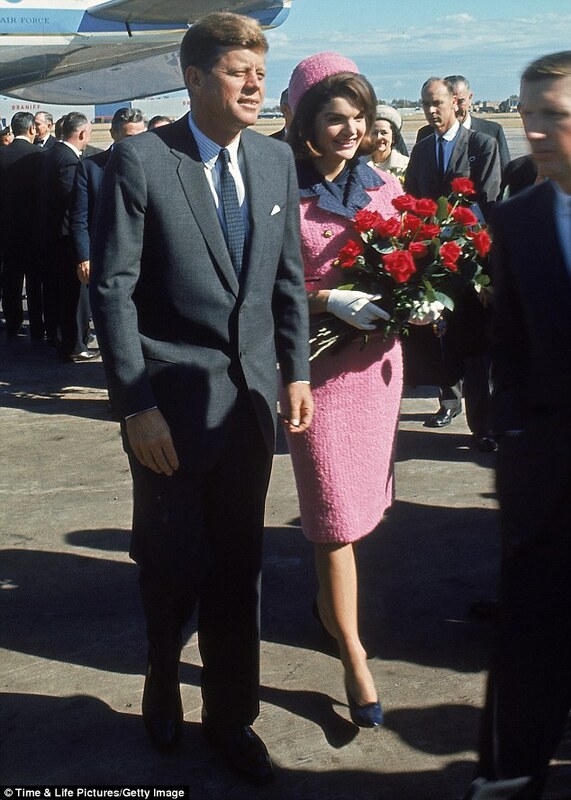 In the aftermath, Mrs. Kennedy’s pink suit was stained with her husband’s blood and when asked if she wanted to change she responded, “No, I want them to see what they have done to Jack”. When Air Force One was on route back to Washington, D.C., with the President’s body placed in a coffin at the back of the plane, the new President Lyndon Johnson was sworn in and he insisted that Mrs. Kennedy was present by his side. 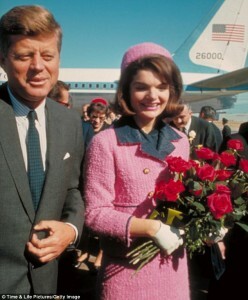 Photos taken that day show a distraught Mrs. Kennedy, hair in disarray and her hat gone missing but still wearing the blood stained pink suit. Mrs. Kennedy never regretted her decision regarding keeping the suit on until she arrived in Washington, D.C. 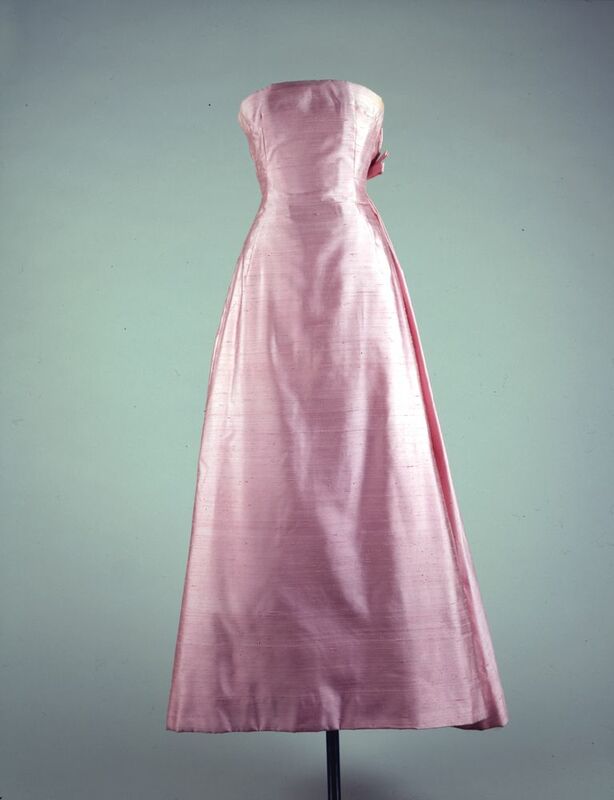 Historical Fashion Note: When Mrs. Kennedy finally removed her pink suit, her maid folded it and placed it in a box that was later sent to Mrs. Kennedy’s mother’s house which she stored in her attic with the simple words, “November 22, 1963”, written on the top of the box. Eventually, the suit was given to the National Archives, transferred into an acid-free container and stored in a climate-controlled room where it has remained there for several years. 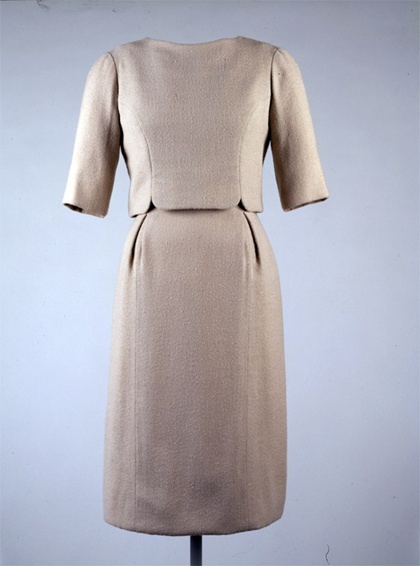 In 2003, after Mrs. Kennedy’s death in 1994, her daughter, Caroline (the last remaining member of President Kennedy’s immediate family), officially deeded the suit to the National Archives with the condition that prevents it from being seen by the public until at least 2103. 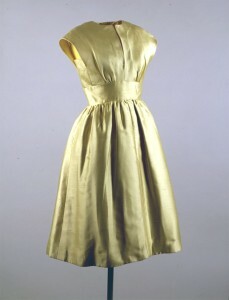 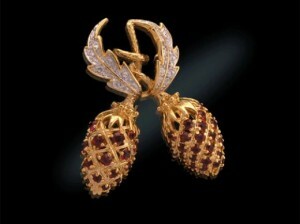 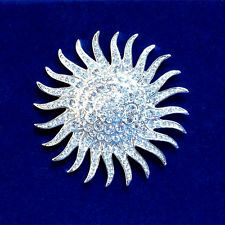 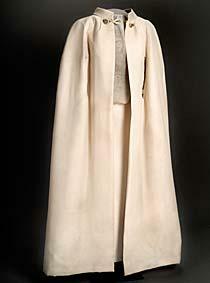 An interesting point is that Caroline has declined to comment on the reasons for this restriction; it is the only item in the Kennedy assassination collection with this specific limited access and other items, such as President Kennedy’s clothing he was wearing at the time of the assassination and be viewed by researchers that meet special criteria of the National Archives. 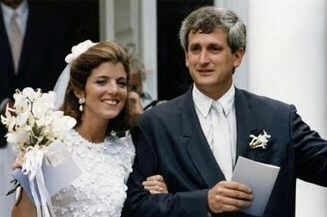 For more information about another important dress, her memorable wedding dress, please look for an upcoming post about the wedding of John F. Kennedy and Jacqueline Bouvier. 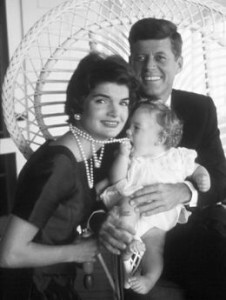 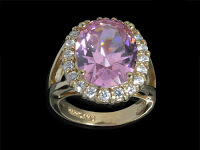 For more information about the Kennedy Presidential Library located in Boston, MA where many of Mrs. Kennedy’s dresses are displayed, please click on the link.